The feeling of opening yourself up to the ocean is one of both beauty and fear. In that moment ‘satori’ is reached, a feeling of instant awakening. Satori is ‘a glimpse of truth’ or a sudden moment of awakening. To have the confidence to overcome your fears and unlock your passions you need to be completely present. 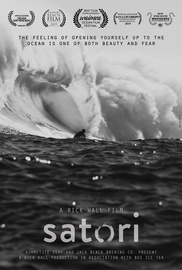 This cinematic film, documenting a group of close-knit big wave surfers who have dedicated their lives to the ocean and riding the huge waves on the shores of picturesque Cape Town, South Africa. Their passion is riding huge waves at two surf breaks situated in South peninsula, the infamous Dungeons below the sentinel mountain in Hout Bay and Sunset Reef 1km out to sea off the small seaside village of Kommetjie. While each surfer is surfing these waves for different reasons, the film discovers that there is a connection that they all feel and believe in. This connection is the raw beauty of the ocean beneath them. Best Film "Ocean Experience" - Waimea Ocean Film Festival 2019. Official Selections 2019: Cine Mar Surf Movie Night, Newport Beach Film Festival, San Luis Obispo International Film Festival. Official Selection 2018: Wavescape Film Festival.